Replacing the front struts on a First generation Mark is so easy, is should be criminal allowing a dealer to do it for you. This is an expanded version, with pictures, of the instructions that Maples8 posted long ago. I installed second generation struts. Turn off the suspension switch, located in the truck on driver's side. Set parking brake and chock one or both rear wheels. Break the tension from all lug bolts on the front wheels. You will need your wheel lug key if you have wheel locks. Lift the front of the car with a floor jack positioned on the motor cross member at the center. If you do not have a floor jack, use the car's trunk jack and jack up each side as shown in the owner's manual. The wheels MUST clear the deck. Use a jack stand to support the car on each side at the motor cross member. IT IS EXTREMELY DANGEROUS TO ALLOW THE CAR'S WEIGHT TO BE SUPPORTED ONLY WITH JACKS. Remove the wheel lug nuts the rest of the way. Remove each front wheel and position it under the car's frame, just behind the front fender opening. 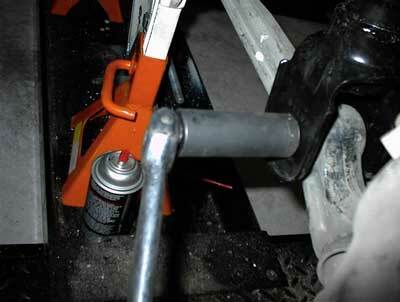 If a jack stand gives way, the weight of the car will fall on the tire, not on your foot or leg. You might lose a tire, but you will keep your foot. Pop the hood. Locate the plastic covers. The following picture shows me touching the plastic cover on the passenger's side. There are two plastic "rivets" holding the front part of this cover to the fender. 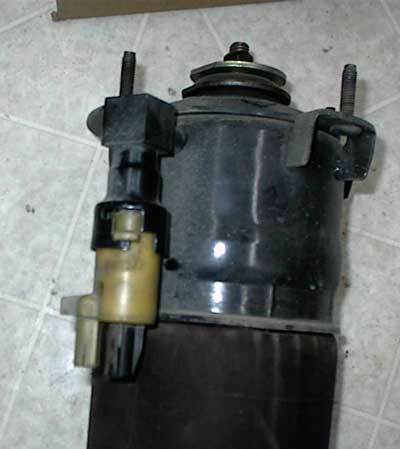 The rear part of the cover is held with plastic tension on a strut bolt. The drivers side is partly hidden by an electronics assembly. You might want to remove the two 8mm sheet metal screws holding the electronics assembly on. There may be a motor access connector attached to the cover as well. If the screws turn in the center of the plastic rivet but the screw does not back out, you will have to help it. Insert the small flat bladed screwdriver under the plastic rivet and apply sideways pressure to the billows of the rivet. Turn the screws with a Phillips screwdriver while applying pressure to the center and the screws will back out. Remove the strut tower nuts. The following picture shows me pointing at one of these nuts. The passenger's side has FOUR nuts. Note the nut holding the bracket at center right. There is ANOTHER nut below that one. You can see the edge of the second nut under the bracket. Remove the metal washer as shown in the following picture. After this task is complete, you are done under the hood. To gain access to the air valve, you will need to reposition the height sensor. The following picture shows me pointing to this sensor. The sensor is held on with two ball joints and spring clips. 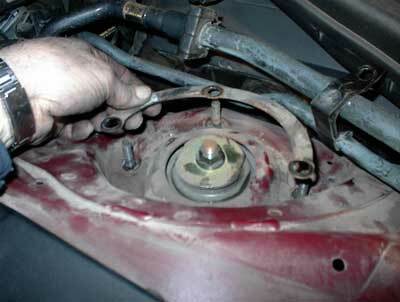 Rotate the sensor clockwise as far as it will go and look at the upper ball joint. There is a small rectangular metal piece located there that is hiding the ball. Using a small flat bladed screwdriver inserted between the joint and the end of the spring, pull against the spring tension while pulling the sensor toward the strut. 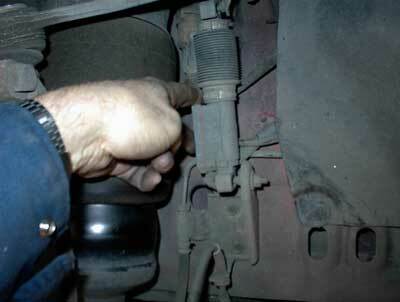 Once free of the ball joint, swing the sensor top toward you and out of the way. Again using the small flat bladed screwdriver, pry gently on the ears that are on both sides of the air valve while you wiggle the connector and apply downward force. Once the ears are moved away from the slight catch in the plastic side of the valve body, the connector comes off easily. Air is supplied to the valve using a single black plastic hose. There is a bright orange collar at the top of the plastic hose. This collar is an internal expansion collet, not unlike what you would find holding the drill bit in place on a Dremmel tool. The hose tip is flared. If the hose if pulled on, as if air pressure is applied, the flared end of the hole will expand the collet and the two pieces can't go though the smaller hole the collet is setting in. 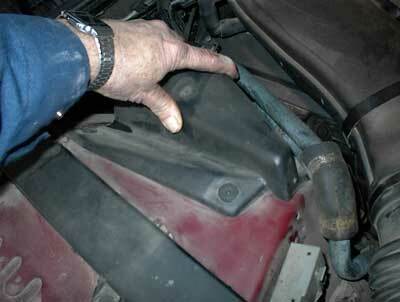 To remove the hose, push UP on the collet (deeper into the valve), while you pull down on the hose. This allows the collet to receive the flare. It acts as a funnel and the hose will slide out of the valve and collet. Now keep pulling the hose down with a gentle wiggle motion. The first time I tried it, both the hose and the collet came out. The second time, the collet remained inside the air valve and just the hose slipped out. Now squeeze the bag. If you can squeeze the bag, you will not have to remove the captured air. Go to step 17. If you can't squeeze the bag, there is air in there and you will NOT be able to remove the strut from the car. I tried compressing a strut that was totally slammed (but still had enough air in the bag to be "not squeezable") with a hydraulic jack. I ended up lifting the car off of the jack stand on that side. So you need to either remove the valve or knife the bag. The pros, when replacing the struts, use a LOCK BLADED knife and stab the bag. They then twist the knife to allow the air to escape around the knife blade. DO NOT ATTEMPT THIS WITH A NON LOCKING POCKET KNIFE! The bag is very tough and a non-locking blade may close on you when you stab. You could cut your fingers off! To remove the valve, notice the picture below. The metal clip at the top of the valve prevents the valve from rotating. Lift up on the wide tab and rotate the spring clip around toward the back of the valve. There is an identical tab in an identical slot on the back side of the valve. Once the spring clip is out, you can turn the valve counterclockwise. Once the plastic tab is free of the slot in the valve cup, pull down the value to the next lower level as shown in the picture below. This will allow the air in the bag to escape. You can now squeeze the bag. You do not have to remove the valve completely. If you do want to remove the valve completely, turn it again counterclockwise and pull it down after the plastic tab is free of the second slot in the valve cup. 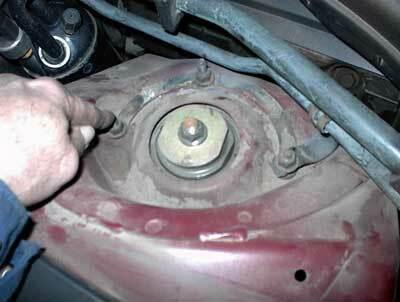 Now you are ready to remove the lower shock absorber (strut) nut. Using a 21mm socket and a breaker bar, grunt down on the nut. The bolt head on the other side of the strut has a metal ear that prevents the bolt from turning. According to the service manual, this nut was put on with a torque of between 199 to 243 ft-lb! The picture below shows us getting down and dirty on the nut. Once the nut is off, tread it back on the bolt and tap it with a hammer to push the bolt out. Leaving the nut on protects the threads of the bolt. You might find it helpful to wiggle the strut up and down while you are tapping on the nut with a hammer. Also, the bolt head and metal ear must clear steering parts. I was able to turn the steering wheel one way or the other, depending on the side I was working on, to allow the bolt to clear the parts as I hammered the bolt out. 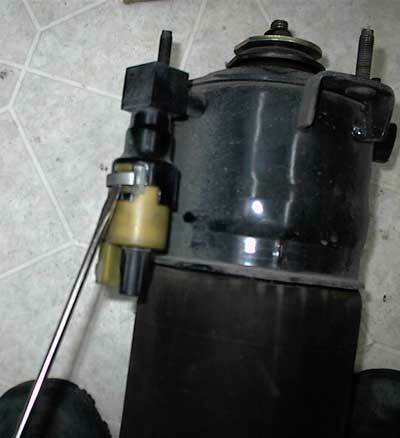 Use a long punch to tap the bolt on through the strut mount, if needed. With no air pressure to fight you, it's an easy task to "compress" the strut and lift it off of the lower mount. Mount the new strut in the reverse order. My struts were "pre-charged" with air. I had to make the bag squeezable by loosening the valve. Once installed and the lower bolt is in, you can reconnect the valve and attach the spring clip. Ford suggests you tighten the lower nut between 199 to 243 ft-lbs. That's a lot. I figured 100 to 150 ft-lbs would be fine. Connect the air hose to the valve next. Just push it up into the collet. You may hear the collet click as it grabs the flared hose end. Now check to see if the valve is properly held in place with the spring clip. Then slide the electrical connection into place. Under the hood, install the ring washer and three mounting nuts. Tighten the nuts between 17.2 to 23.4 ft-lbs. Don't forget the fourth nut on the passenger's side that holds the bracket. Put the electronics back in place on the driver's side. Install the plastic covers over the shock tower. Before removing the jack stands, I lowered the car to the minimum jack stand height and turned on the air suspension switch in the trunk. This allowed the compressor to pump up the new struts without the full weight of the car on them. I then shut every thing down and removed the jack stands completely. The car still looked "slammed" to me. Some members suggest manually turning on the compressor to air the struts before you bring the car off of the jack stands. Care must be taken here in that you don't "forget" you turned on the compressor and over-inflate the bags. When my warranty company did HOTLNC's front struts (1200 bucks!) last year, they wanted to check wheels alignment. Of course, that wasn't covered. I questioned the sanity of checking the alignment since no alignment critical part was replaced. I was told it was "policy." Fine - I told them to go ahead and paid the extra 60 bucks with a fair amount of grumbling. So fine. Maybe you would like to have the alignment checked?